Following our last post on understanding sustainability across the United States, we will focus on sustainability in South America and Middle East. While not often associated with the sustainable movement, Medellin, Colombia has gone from a city known mostly for drug gangs and violence to one of the world’s most innovative cities. They have hosted the World Urban Forum, which had 22,000 attendees, and promoted equitable development in the urban environments in which a majority of the world’s citizens already live—and where two-thirds will reside by the year 2050. A key theme of the forum hosted by the city was the emerging consensus on the need for environmentally, socially and economically sustainable development. Thanks to the city legislation and an ongoing commitment to sustainability and better living environments for its citizens, the city of Medellin continues to implement solutions that are solving problems as they relate to transportation and public spaces. In 2012, the city was recognized for its efforts as the Institute for Transportation and Development Policy, an international nonprofit that works with cities to reduce greenhouse gases and improve the quality of urban life, presented the city with the Sustainable Transport Award. The city also received the 2013 Harvard Graduate School of Design Veronica Rudge Green Prize in Urban Design for the project Northeastern Urban Integration Project. One of the city’s largest sustainable drivers has been the Northeastern Urban Integration Project (Proyecto Urbano Integral, or PUI). Initiated in 2004, its goal was to harness opportunities presented by the MetroCable, a new cable car project connecting three settlements to the metropolitan transit system. In concert with the MetroCable, the PUI has made a significant contribution toward improving the quality of life for nearly 170,000 residents experiencing social and economic inequality. By reducing travel times to the city center from over an hour to less than ten minutes, the MetroCable has enhanced access to employment opportunities by essentially joining the formal and informal city. In addition to its existent sustainable transportation projects, which include cable cars, the metro, as well as various other initiatives, the city has also developed an array of newer sustainable projects. As part of the Urban Integral Project, the city has improved the quantity and quality of public spaced by means of pedestrian connection improvements, environmental parks, and urban promenades. “EnCicla”, a public bicycle system that is part of the city’s master plan, has started with integrating universities and other key destinations of the city. There has also been the development of Bus Rapid Transit (BRT) “Metroplús”, which fully integrates (physically and fare) with the existent mass transit (metro and cable car). A giant outdoor escalator for residents of one of its city’s poorest areas was also developed, and ascends nearly 384m (1,260ft) in the steep hillside district of Comuna 13. 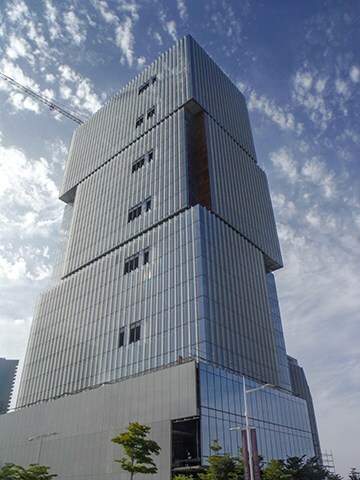 Al Maryah was named the 2015 Tower Project of the Year by Construction Week. The Middle East is known for its extreme climate, with limited annual rainfall and extremely hot temperatures. As such, the region has focused a great amount of effort on sustainable design strategies throughout a variety of categories, including sustainable sites, water conservation, energy conservation, and resource efficiency. In 2007, Abu Dhabi’s local government created a master planning document called “Plan Abu Dhabi 2030”. As the government’s first approach to sustainable master planning, the vision will look to achieve numerous sustainable measures and a focus on smart growth and infrastructure. With an ultimate goal of preserving and enriching Abu Dhabi’s physical and cultural identity, the Estidama (Arabic for “sustainability”) initiative was developed. Estidama works on four equal pillars of sustainability: environmental, economic, social and cultural. An essential tool to advance Estidama is the Pearl Rating System (PRS), which provides guidance to rate a project’s potential performance in relation to the four pillars. The PRS consists of three different categories: Pearl Community Rating System, Pearl Building Rating System (PBRS) and Pearl Villa Rating System. The achievement of the PRS design rating is required of all strategic developments in Abu Dhabi before they can obtain building permits within the municipalities. According to the Abu Dhabi municipality, all new projects must achieve a minimum one Pearl rating to receive approval from the planning and permitting authorities. Government funded buildings must achieve a minimum two Pearl rating. Along the lines of sustainability, water conservation has become a top priority in the region, with high-efficiency plumbing fixtures and HVAC systems reducing environmental strain. Another priority is protecting from the residents from the extreme temperatures, which leaves room for creative solutions that allow for high heat absorption and a reduction of heat gain. The region also has incredibly high solar potential, but while initiatives have been created to invest billions of dollars in solar energy, low utility rates have made the initial payback cost prohibitive. The Al Maryah Tower has earned the project global accolades, including the 2015 Tower Project of the Year by Construction Week. The project, which achieved an Estidama one Pearl rating, is the first private development on Al Maryah Island. Numerous schemes were developed to reduce structural costs and construction times, and the final design provides column-free interiors and generous cantilever spans, made possible by post-tensioned concrete. The Zayed Military Hospital, a new 1.25 million square-foot healthcare facility composed of multiple building structures, achieved and Estidama two Pearl rating. It was recognized for its energy efficiency, causing minimal site disturbance, efficient use of building materials, and reducing water and energy consumption.